Jayco travel trailers are very popular. The company has been in business for over 40 years, and has a solid reputation. 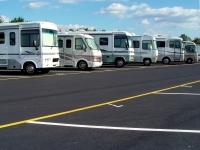 As one of the largest RV manufacturers, Jayco also has a large dealer network. This is important not only for getting a great price, but also if you need service work while on the road. There’s a Jayco RV to match almost any need. The product line includes camping trailers and pop up trailers, light trailers and large ones, fifth wheels, toy haulers, and motorhomes. The product line has good depth. Not only are a variety of floor plans available, but there is a wide range of prices too. There are campers available to fit even modest budgets. Jayco tends to avoid high-price luxury models. The company is known for solid RVs at a good price and good value. Like other major manufacturers, Jayco has an owner’s club, with many local chapters. You can also get a factory tour if you’re ever in Middlebury, Indiana. Reservations are not required, but calling ahead is a good idea. Be sure to check out this page on getting a great deal on an RV, Jaycos included. As an example of the terrible toll the economic downturn has taken on the industry, Hi-Lo Trailer closed its doors a few days ago. Hi-Lo was famous for its unusual style of RV — a telescoping travel trailer. The top fit over the lower portion. While traveling, this made for a compact trailer with a low center of gravity. Not only was this safer to tow, but the hard sides made it possible to camp in the winter as well. While camping, the top locked in the raised position with an automatic hydraulic system. Hi-Lo Trailer Co. Inc. was in Belleville, Ohio. It was founded in 1955. The end of the company was announced in a July 6 letter to Hi-Lo dealers from company President Jim Beveridge. ”In light of the current economic situation and the downturn in sales of recreational vehicles, Hi-Lo Trailer can no longer continue to operate,” the letter said. The announcement came as a surprise to many. Late last year, the company announced that it had streamlined its 2010 product lineup to include four floorplans based on the Hi-Lo Classic. This implied that the company was surviving the recession.